I discovered this recipe for Baked Chicken Parmesan in a cookbook I’ve owned for probably 10 years, Dietitians of Canada Great Food Fast. It has easy recipes that are healthy and really easy to make. I’ve made this recipe a few times and it’s always popular with John and the kids. All the ingredients are easy to find that you may already have on hand! You can serve it over rice or pasta to make it a complete meal or just eat it on its own like I do. Easy, cheesy, mouthwatering comfort food! In a large skillet, heat 1 tsp of oil over medium-high heat. Add chicken breasts and sear for 1 to 2 minutes per side until golden brown. Transfer to a baking dish. Heat remaining oil in the skillet. Add zucchini and onions and saute for 3 to 5 minutes until lightly browned. Remove from pan and place on top of the chicken. In a bowl, mix the tomato sauce and Italian seasoning. Pour over the chicken and vegetables. Sprinkle with mozzarella and Parmesan cheese on top. Bake in a 350°F oven for 30 minutes or until juices run clear on the chicken when it’s pierced with a fork. I used to make chicken Parmesan very often b/c my brother loved it. My recipe was very simple. Essentially, I dipped chicken breasts in beaten egg and then in Italian flavor bread crumbs. I put them in a baking dish with pasta sauce(flavor of choice) and baked for about 25 min. I sprinkle with Italian blend shredded cheese and bake for an additional 5 minutes or until cheese melts. Serve with garlic bread. I actually have all the ingredients on hand, now I know what to make for dinner. All my favorites in one recipe. Sounds delicious. This looks really good. Plus I love that it’s healthy for you. thanks for sharing. Another great recipe! Looks tasty, healthy, and easy. I’ll have to try this one 🙂 One day when I have time to cook again! I’ve never made chicken parm without breading…this looks just as good and a bit quicker. I’ll have to try it. i just finished copying your recipe down (don’t have a printer here in Florida) and look forward to making it when I get home. I’m always on the lookout for simple, tasty casseroles, and this one fits the bill! Thanks. This sounds good! Thanks for sharing the recipe. It sure looks delicious in your picture. It also sounds easy to make. So I could probably manage it. Unfortunatly I don’t have any zucchini 🙁 If I did that would be in the over right now. I think my hubby would really like it. My family’s New Year’s Resolution was to make at least one new recipe a week! It has been a long time since I have had this and have never made it myself. This recipe doesn’t look too hard so we will give it a try! YUM! Thanks for the post! This looks delicious. I have never added zucchini to ours before. I need to try that. Sounds great! 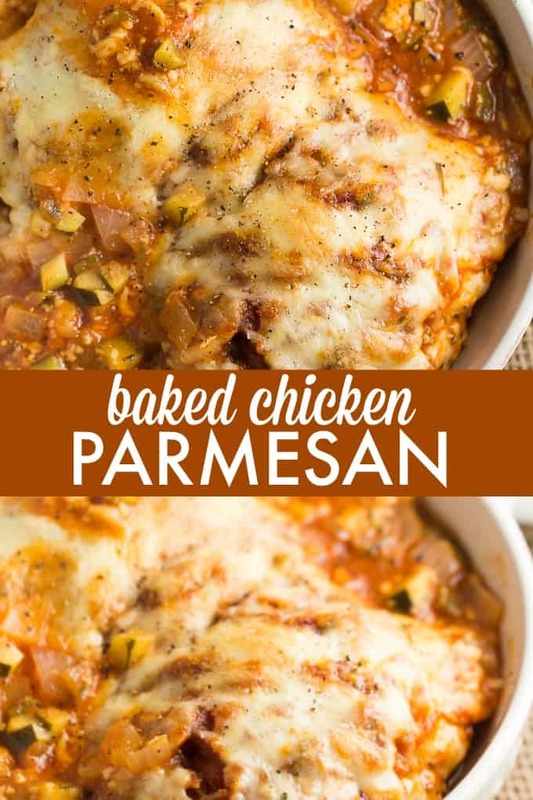 Chicken Parmesan is one of my fave dishes but it’s usually really hard to make or at least time consuming, this recipe sounds easy enough. Anything with chicken and zucchini is a-ok in my book! I make this and serve it over rice. The kids love it. They aren’t fond of zucchini so I sub in red and green peppers. This looks pretty good and I like how it has veggies. We eat alot of chicken & this recipe looks delicious! Thanks! I love Chicken Parmesan and haven’t made it for a long time. I’ll have to try your recipe! It sounds wonderful! 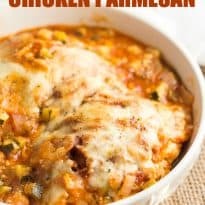 I love Chicken Parmesan, I like how this recipe has veggies. love this-will make- thank you. Your recipe looks totally delicious and one that my family would enjoy! Thanks for sharing your recipes with us this week at Snickerdoodle. Pinning to share. 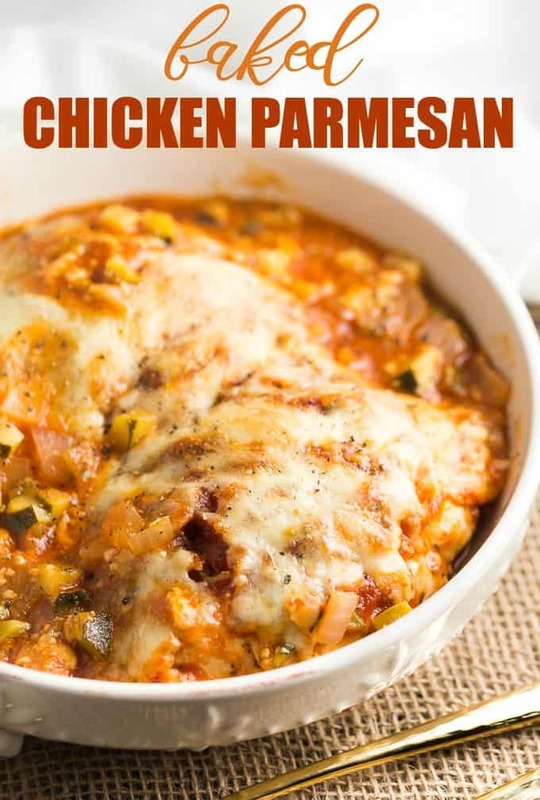 We will really enjoy this recipe, we love Chicken Parmesan. Hope you are enjoying your day and thanks so much for sharing your awesome post with us at Full Plate Thursday! Thank you for sharing this post on the Simply Sweet Home Linky Party. You are my pick for this week’s party and you will be featured on my blog. Yum! I’m adding this to my recipe to-make list! Thanks for stopping by Turn it Up Tuesday Link up! That looks amazing! Thanks for sharing it with us at Funtastic Friday! Yum, this sounds like a healthier parmesan chicken recipe than I usually make. Will have to try this. Pinned.